Product information "Automotive 24GHz radar development kit / KIT_ATV_24GHZ_RADAR"
This development kit allows customers to implement and test 24GHz radar applications as Doppler movement detectors, FSK or FMCW range/position measurement. It comprises a BGT24A transceiver MMIC family, e.g. 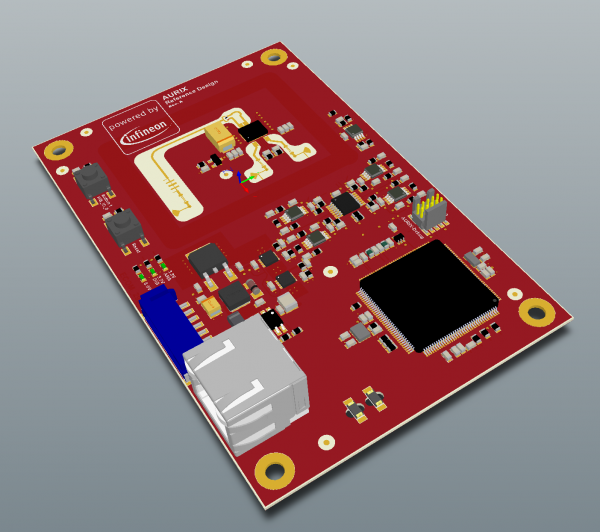 BGTA24ATR12, and an AURIX™ 32-bit radar microcontroller family, e.g. SAK-TC264DA- 40F200, for high-performance signal processing. The device has an FFT acceleration engine and extended memory for radar image storage. The CPU is already pre-programmed with a sample application which samples up to four of the transceiver chip’s IF channels. The measured results are transmitted via a 10/100 Mbit ethernet connection. The enclosed firmware supports transmission via ethernet and data display on a Windows PC. This platform is therefore a good starting point for proprietary applications. The development kit includes 12° x 25° patch antennas which can be replaced with SMA connectors, so users are free to use their own antennas. Related links to "Automotive 24GHz radar development kit / KIT_ATV_24GHZ_RADAR"
Customer evaluation for "Automotive 24GHz radar development kit / KIT_ATV_24GHZ_RADAR"